A Mothers Ramblings: Monday Bags And What They Are! The other day I posted a picture on Instagram and said that the "Monday bags are filled ready for when the children wake up. I have no idea what is in them this week." and it generated a lot of questions.. mainly What on earth are Monday bags, Where can I get a Monday bag and what was in your Monday bag?! So to explain, I need to go back to Christmas Day. This year Daddy had made the normal gift for me (Mr Tea Towel Cat) and had also made a second gift, which was for Top Ender, Big Boy and I to share. When we got to the gift for us to share we opened it up to find three bags inside. 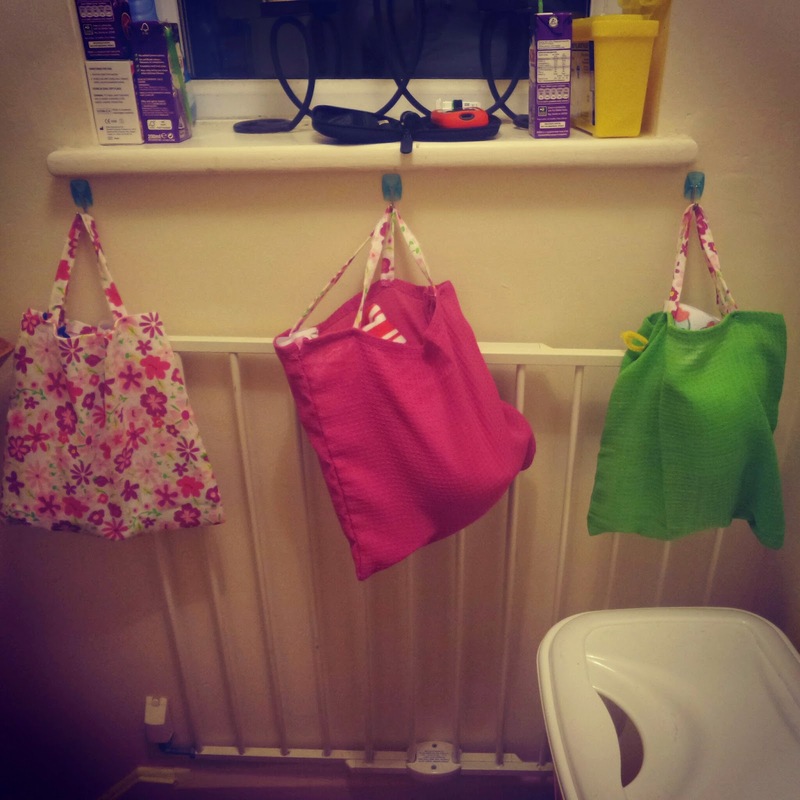 We looked to Daddy who explained that he'd made these three bags (again from tea towels) for us to be used as Monday bags. It was a gift for us, but also for him. You see, Daddy decided that what he wanted to do every Monday when he left the children and I at home was to leave us something that would remind us of him and during the week, whilst he was away he wanted to think of us by finding or making a great gift. The first week, Daddy put notebooks into the children's bags and naughtily he put some of my favourite chocolate covered nuts in my bag (only six of them so I had them one a day). The second week, Daddy gave the children Tea Towel Kittens and a tube of cake. No, seriously it was a tube of cake and it was totally the best cake I've ever had. Someone really needs to remind Daddy I'm on a diet. And as the children aren't awake yet today we don't know what's in the bag today yet all we do know is that Daddy loves us and we love him!